BIO – IN DETAIL – If you want to know more..
Born in Sao Paulo city, Juliana began her professional artistic career as an actor at the age of 13, working with the directors Luiz Gustavo Alves and Walcyr Carrasco. In 1991, she met the journalist and writer, Ruy Castro – author of the bestseller book : “ Chega de Saudade – the history and the stories of Bossa Nova”. Ruy Castro’s nicknamed Juliana “The Bossa Nova Baby” and thanks to him she went behind the scenes, watching rehearsals and concerts of legendary musicians and composers who have created and kept the Bossa Nova musical movement alive: Ronaldo Boscoli, Luizinho Eça, Claudette Soares, Miele, Peri Ribeiro,Tião Neto ( Tom Jobim‘s bandbassist), João Donato, Roberto Menescal, Carlos Lyra, Wanda Sa, Marcos Valle, Joyce, Ancelmo de Carvalho, Carlos Vinhas, Maurício Einhorn, Johnny Alf, Tito Madi,Billy Blanco, Toquinho, Leny Andrade, Rosa Passos, Leila Pinheiro,Alaíde Costa, Os Cariocas, Zimbo Trio, Garganta Profunda, Carlos Coutinho, Adriano de Oliveira,Lúcio Nascimento; Sivuca, Gilson Peranzzeta, Sebastião Tapajós, Luizão Maia, irmãos Araken e Moacyr Peixoto, e Wellington Romano. As a result of these experiences her love for Bossa nova evolved into a desire to become a professional singer. Behind the scene of the ” Chega de Saudade” Concerts. Tiao Neto (in black), Ruy Castro ( holding his book), Juliana Areias (in black), Wanda Sa and Luizinho Eca (in white). After a short period living in Brasilia, the capital of Brazil, she moved to Salvador, one of the most musical and vibrant Brazilian cities. While working as an artistic manager and business partner of the company named “Atelier do Ivo Gato – Artistic Productions” – she was involved with creating, co-ordinating, producing and directing large events and set designs for cinema, television and theatrical plays, including the Super Production “Lidia de Oxum – the Black Opera”, directed by Paulo Dourado, and conducted by Júlio Medaglia at the “Castro Alves Theatre” in 1995. 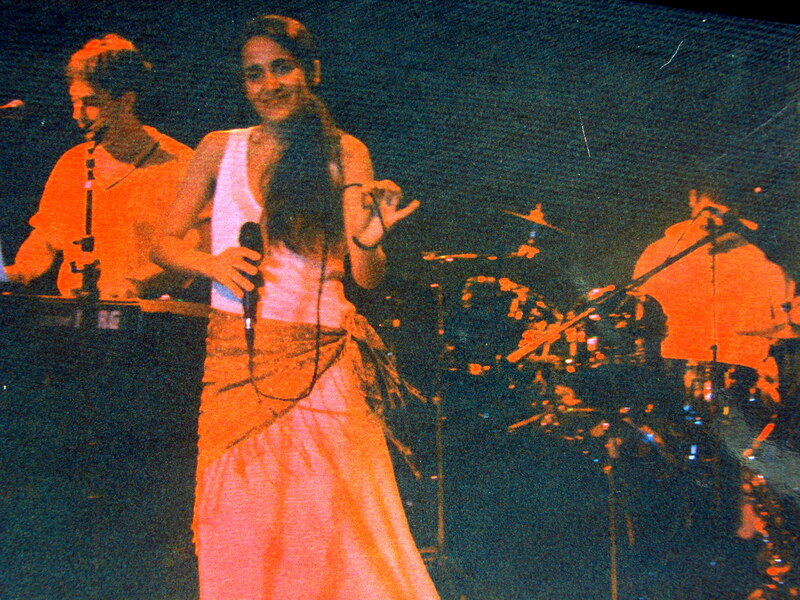 In Salvador, Juliana began performing informally as a singer with Carlinhos Franco and Vainer Dias Gomes at “Sariga’s beach kiosk” in the idyllic Itapuã Lighthouse Beach – a magic place that has always inspired major Brazilian poets and composers such as Vinícius de Morais, Dorival Caymmi, Caetano Veloso, and Gilberto Gil. Her musical debut by the sea creates a special analogy with her surname Areias which in Portuguese means “beach sands”. From the sands of Itapuã Beach to the world, Juliana Areias is an authentic Brazilian singer and composer living overseas since 1996. She has worked the European music circuit performing as an independent and freelancer vocalist with babds such as Amazonia, Jazz Brasil, Sambrasil, Cachasamba, Jazz Orange, Tupi or not Tupi, Fofao do Cavaco – at major events such as : The Montreux Jazz Festival 1998, The Cairo International Song Festival 1999; Geneva Festival ( Fete de Geneve); United Nations conferences ,“Mason Paulo Freire ‘ seminars and workshops and French TV2 broadcastings. She has also studied at the Geneva Popular Conservatory and at the Mason de la Musique and she has been part of the “Compagnie Vice versa Musical Productions” directed by the French singer Ingrid Wildemann. Juliana Areias has recorded for the poet, composer and Brazilian diplomat Marcio Catunda, since 1997 , singind at 6 of his albums produced in Switzerland, Bulgaria, Brazil, Spain and Portugal. 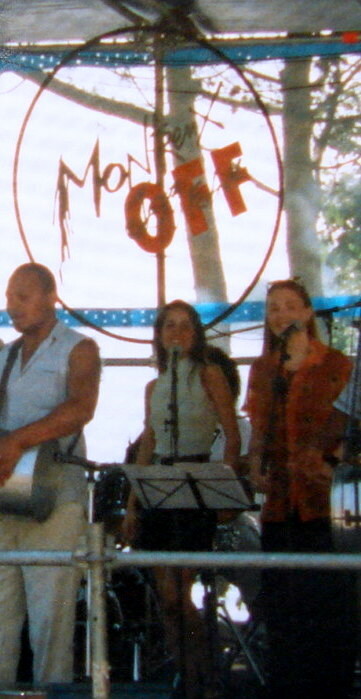 Bel Bossa : Martin Salim, Juliana Areias and Johannes Dimyadi – 2005. 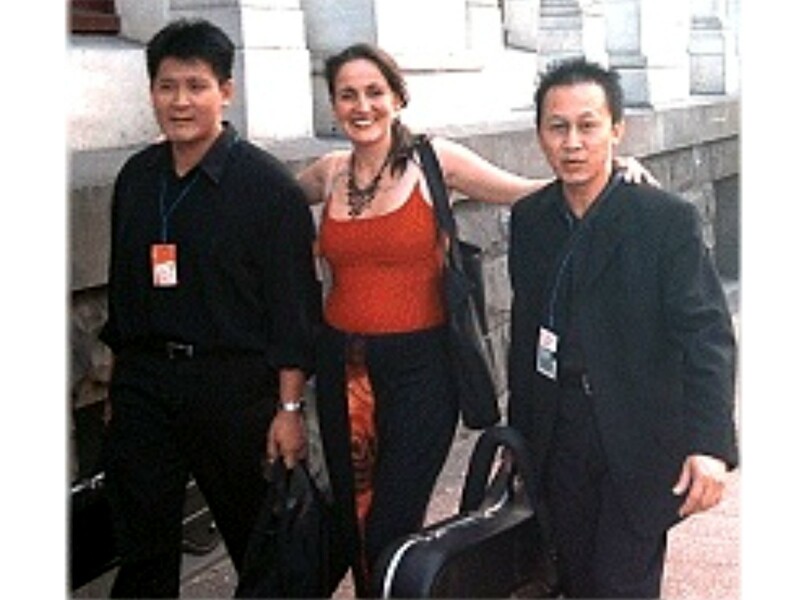 Moving to New Zealand at the end of 2000, Juliana Areias performed at The Montana Jazz Festival 2001/2/3, The America’s Cup 2003, The Jambalaya Festival 2003/4 and The Auckland Festival2003/5. She also opened the international Musicals Chicago and Lady Salsa as well as on several TV, Radio Channels and for Government’s Conferences, performing with Bel Bossa, Soul Brasil, Brisa Louca,Corcovado, Mombasa, Baque Virando, AK Samba, Samba Maracanã and Vox Nova. Bel Bossa trio at AK05 – Auckland Festival 2005. Martin Salim, Johannes Dimyadi and Juliana Areias. From 2000 to 2007, introduced by the musician Mani Fagundes, she also worked for the University of Auckland as a tutor, research assistant and Brazilian Music Expert for the Free Samba Project, created and coordinated by Dr. Christopher Naughton – PhD in Music Education. The project consisted of performing and teaching Brazilian Music, Dance and Culture – with authentic instruments imported by the university – to students from Tertiary, Secondary and Primary schools and to the open community in general. The aim was to promote multicultural awareness, integrating new possibilities, influences and elements to inspire and fuse with the New Zealand Culture. As Juliana Areias passionately explains: “ Brazilian Culture and Music are strongly recognised worldwide for their richness, reflecting the great racial and cultural miscegenation of Brazil and for their ability to continually absorb influences from all races, infuse them with their own strong roots and send the results back out into the world as a new and authentic Brazilian Cultural manifestation.” The outcome of this project has indeed created a positive Brazilian influence within New Zealand Contemporary music which is evident in the work of bands such as,“Batucada Sound Machine” , founded by James Hughes – former student of the Free Samba Project. BSM has already performed at The WOMAD Festival in London, at The Sydney Festival and at The Perth International Festival in 2009. 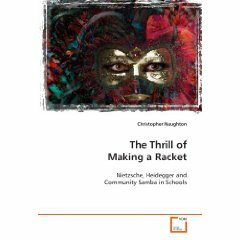 To know more about the Free Samba Project Research, read “The Thrill of Making a Racket : Nietzsche, Heidegger and Community Samba in Schools” byDr.Christopher Naughton – PhD in Music Education /Founder and director of the projet . Juliana Areias’ official debut concert in Perth occurred in March 2009, a full house concert at Kulcha – The Multicultural Arts Centre of WA in Fremantle, where she presented Aquarela, So Brazil and Ginga Brazil projects consecutively. Since then she has established a name for herself and has become the most prominent reference in Brazilian Music around Australia with consecutive sold-out shows at Australian’s finest jazz venue, The Ellington Jazz Club as well performances at the Ritmo Festival in Darling Harbour- Sydney for 30.000 people since 2011. The success of her carrier, lead up to the release of her debut solo album. In 2015, Areias released Bossa Nova Baby, her first original album which she recorded with jazz musicians including Doug de Vries, Pete Jeavons, Graham Wood, Ray Walker, Marcio Mendes, Chris Tarr, and Paul Millard. The album contains 12 songs, all of which were influenced by the places she has lived and traveled. The album was funded by a successful Pozible crowdfunding campaign and was also sponsored by the Department of Culture and the Arts of Western Australia. The album scored multi-award nominations, including Best World Music Act 2015 and 2 nomitations for WAM Songs of the Year 2015 ( for ” Flecha” and “Mare Cheia” . The Bossa Nova Baby album featured at ABC Radio National as the “Changing face of Australian Music” on the Australia Day 2016 and has been receiving regular airplay on radio stations throughout Australia, Europe, Japan, EUA and Latin America. Since 2015 Juliana Areias has been touring the Bossa Nova Baby show around the globe. Most recent highlights include, USA and Japan Tours, Sydney Opera House, Ronnie Scott’s (London), Munganga Theatre (Amsterdam), Cairns Jazz Up Series, The Kings Park Festival, The Perth International Jazz Festival , Foundry 616 and 505 in Sydney, New York’s exhibition “Van Gogh, Dali and Beyond” at The Art Gallery of Western Australia. Juliana Areias – Bossa Nova Baby Album won The Best Brazilian Album released in the U.S. – Focus Brazil Awards in Florida 2019. It was also the finalist of multiple nominations for The Western Australian Music Awards including WAM Song of the year – World Music Category 2015 and WAMi Best World Music Act 2015/2016. 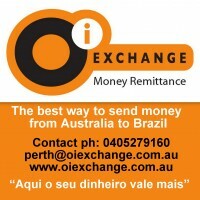 It has also been receiving regular air play in Australia, Europe, Japan, USA , Brazil and Latin America.